Heavy metal pollution of arable soils is one of the major limiting factors affecting the plant growth and productivity worldwide. In particular, contamination of agricultural soils with cadmium (Cd) is one of the most serious agricultural problems in the world. Although Cd has no biological function in plants, it becomes easily available to the rooted plants. As soon as Cd enters the roots, it can reach the xylem through an apoplastic and/or symplastic pathway. Plants show a differing metal distribution and accumulation pattern among different plant parts. Once Cd enters the cells, it may disturb many physiological and metabolic processes in plants. Cd is a highly toxic nonessential element to plant growth and development and causes plant death even at low concentrations. It evokes a whole array of toxic effects, due to its long biological half-life and storage in plant vacuoles, interacts with carbon and nitrogen metabolism, interferes with sulphur assimilation and glutathione metabolism and decreases the absorption of nutritional elements, and causes oxidative damage. Plants are very well equipped with a wide array of defense mechanisms to cope with Cd accumulation and toxicity. 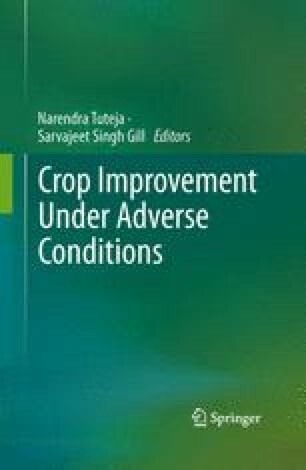 The present chapter discusses the mechanisms of Cd toxicity and tolerance in crop plants. Work on plant abiotic stress tolerance in NT’s laboratory is partially supported by the Department of Science and Technology (DST), Government of India, and Department of Biotechnology (DBT), Government of India.